If there is one topic that comes up during any conversation in Nicaragua, it is the Nicaragua Inter-Oceanic Canal. Half the population believes in this dream, the other half thinks it never will happen. This is a centuries old dream, and most Nica’s would love to see it happen. However, others oppose it with passion! 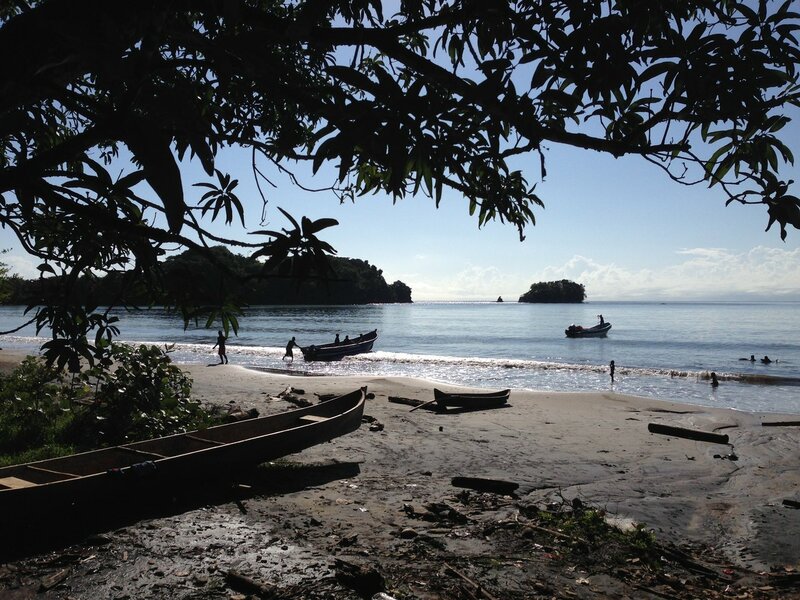 Few Nicaraguans have ever been to the Caribbean Coast. Thus, most have no real clue of what the reality is there. I decided to go out exploring the Caribbean Coast of Nicaragua and see for myself what the reality is all about. It’s easy to understand why so few Nica’s have never gone out this way. For one, it is hard to get to. The area that is earmarked for the Canal Project is south of Bluefields. This is the largest community in this part of Nicaragua. There are two ways to get to Bluefields. The first, and easiest is to take a flight with La Costena Airlines from Managua direct to Bluefields. Flying time? Just over an hour. The route is scenic, flying over the northern end of Lake Nicaragua, then across the grasslands of Chontales. You can see the agricultural frontier expanding into the forests of the RAAS as you are getting closer to Bluefields. The second alternative is to take a bus from Managua to El Rama, and then a boat down the Rio Escondido to Bluefields. This option will take a full day of travel. I have traveled both alternatives. My suggestion is take the second option if you have the time. It is a matter of time before a road is open to Bluefields. When that happens the River Port at El Rama will die. This is an experience that you will soon not be able to enjoy. Make sure you leave Managua as early as possible. The Trip to El Rama takes about 6 hours from Managua. Some travelers prefer to do the trip overnight, arriving in El Rama at around 3:30 a.m. This way, they can catch the first panga at 6:00 a.m. There are many different fast boats always ready for departure at El Rama. Boats leave whenever they are full, and this is an ongoing process. There is only one glitch: Navigating the Rio Escondido is a day light trip. This means that the last boats leave el Rama by 3:00 p.m. If you arrive afterwards, you will need to spend the night in El Rama. If you end up having to spend the night, Hotel Costa Verde and Hotel Rio Escondido are your best bets. The trip down the river will take you through jungle clad river banks. After almost 2 hours, you will find yourself in the Bay of Bluefields. This is a rather shallow bay that has restrictions to the size of vessels because it is depths. Because of this the actual port, called El Bluff, is actually at the entrance to the bay. 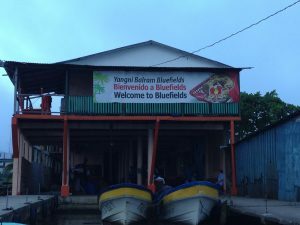 The Panga trip from el Rama to Bluefields takes about 2 hours. The cost will be roughly $10 US dollars or its equivalent in cordobas. As a port, El Bluff is actually quite limited, because there are no roads that lead to or from it! This means that all goods that arrive here must be transferred by smaller boats to Bluefields. Again, there is no highway from Bluefields to the rest of Nicaragua. As such, El Bluff is a small local port that is home to the largest fishing fleet in Nicaragua. If you on your way to the Corn Islands, take note that it is easier to catch a ride in the cargo boats that leave from El Bluff. Travel between Bluefields and El Bluff is quite easy, as there are always boats coming and going. Upon arrival to Bluefields, I needed to secure myself a room. There are many different hotels available in town. I had an appointment set up with the Rama Kriol Autonomous Government for the next morning. So after checking into the Hotel Caribbean Dream I set out to explore town. My mission was to find the exact location where my meeting was to take place the next day. The meeting with the authorities at the Rama Kriol autonomous government was most interesting. You see, it turns out that about 1500 Rama Indians, and 2000 Kriol African Americans are the legal and rightful owners of a huge expanse of land that runs parallel to the Caribbean Coast. 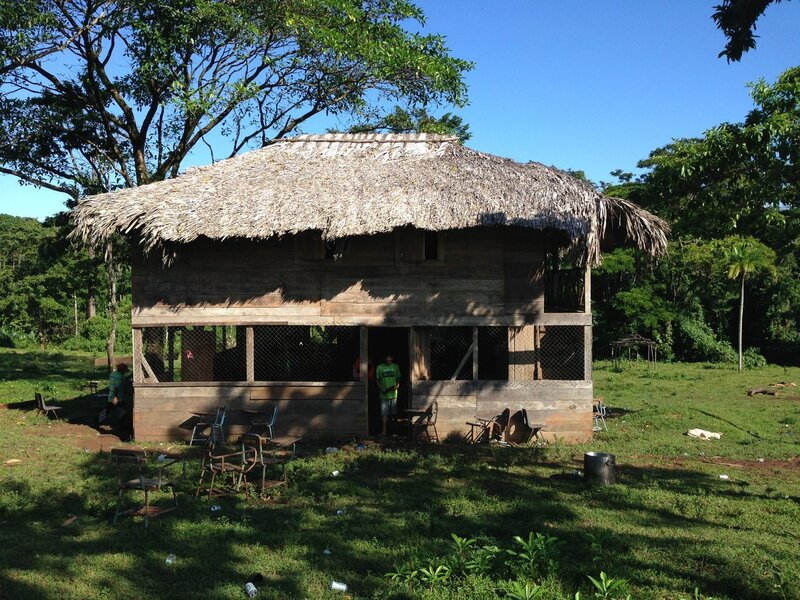 Their land goes from just south of Bluefields all the way to the border with Nicaragua along the San Juan River. They agreed to take me south, on a boat along the Caribbean Sea to the Community of Ban Ku Kuk. This community is just south of Monkey Point, the best location on the Caribbean Coast for a seaport. So after making the proper arrangements, we agreed to leave early the next morning. As a general rule, the surf tends to get rougher as the day progresses. This means that an early departure guarantees a smoother ride! It was a beautiful morning in Bluefields. As the fog lifted over the Bay of Bluefields I boarded our speedboat. We went across the lagoon, into the Caribbean and due south. A dark blue sky and no surf at all, allowed us to make fast progress. We were in Ban Ku Kuk in less than 1 ½ hours! The current plan for the canal calls for the entrance to be south of Ban Ku Kuk, in the Punta Gorda area. The project includes a paved highway to Ban Ku Kuk as part of the infrastructure needed. Ban Ku Kuk is a small village on the coast. They do not even have a dock, so you must jump of the boat and get your feet wet to disembark! The community has no power, no telephone communication, and no medical facilities. It does have a small dilapidated school though. A land trail interconnects it with Monkey Point, due North. You can also follow another path to the south to mouth of Punta Gorda, where you will need a boat to cross the river. One thing was clear to me: the Caribbean Coast of Nicaragua is not developed. There is little or no government presence in the area. The people living in this area, which could be a piece of paradise, have been on their own for centuries. The Rama Indians and Kriols that live here have maintained their basic subsistence throughout the years by living in harmony with nature. If the Canal is built, their world, as they have known it for generations will change forever. I will not get into the discussion of whether the canal would be good for them or not. In the end it is up to them to decide. Change will be massive and irreversible if it does happen. It is hard to imagine any alternative to the lives of these people. The Caribbean Beaches are beautiful, and there are plenty of small islands and Cays along the coast, these do not boast the barrier reefs that are present in the Bay Islands of Honduras. Devolepment of the area via tourism is a far cry from today’s reality. I am lucky that I had the chance to visit Monkey Point and Ban Ku Kuk before construction begins. Unfortunately, there is no real place to stay in either community. Ban Ku Kuk has a multi service community building that offers some extremely basic rooms. The facility does not have a fan, in building bathrooms and of course, electricity. Monkey Point has a bit more infrastructure, because there is a fishing facility there. They also have a small dock and a building used as a restaurant. Electric Power, needed to keep the freezers running for the fishery, means that the community has power during certain hours of the day. A small, basic hotel operates from time to time. But you never know if it will be open or closed. The cays nearby are pretty, but with a limited reef surrounding them. And although the beaches are nice, they are not spectacular. Perhaps the canal could in a way help preserve some of the Rama Kriol territory, especially the area to the south, known as Indio Maiz Reserve. If you are really adventuresome, and are willing to spend some money to get to see this area, make sure you bring good camping equipment. Of course, credit cards and ATM machines are not useful items in this part of the world, so make sure you bring lots of cash. Keep in mind that traveling on the Caribbean in a speed boat can get pretty rough. The entrance into the rivers mouths from the sea can be a harrowing and dangerous experience if the surf is up. You will need a good captain that is familiar with the area! Unless you are looking to interact with the Rama – Kriol people of Nicaragua, you are best sticking with a trip to the beautiful Corn Islands of Nicaragua.